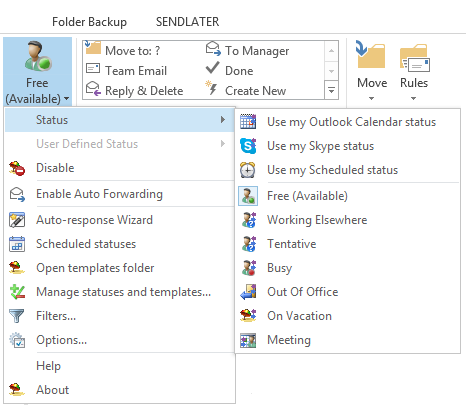 Email Responder Out of Office Auto-Reply settings and compatibility. After the Email Responder Out of Office reply assistant is installed, the Email Responder button is added to the Microsoft Outlook toolbar. Access all available options of Email Responder that allow you to change a status, apply filters, manage status types and templates easily - in just one click. You can also Enable/Disable Email Responder, select to use the Auto-Reply Wizard when setting up a status for the first time, view/edit scheduled status types, manage them and templates or access other available filters and options. Email Responder is compatible with all Microsoft Outlook versions. 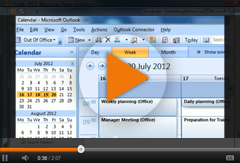 Email Reponder Out of office autoresponder is compatible with all Microsoft Outlook versions. It works with Microsoft Outlook 2000, XP, 2003, 2007, 2010, 2013, 2016 and is compatible with Microsoft Windows® 2000/XP/2003/Vista/7 and the latest Windows 10.